Asking the user to open the browser console just to see a few lines of text is asking for too much. You can simple include my console-log-div script instead. It will create a new element at the end of the body element, where all console.log and console.error messages will be mirrored. 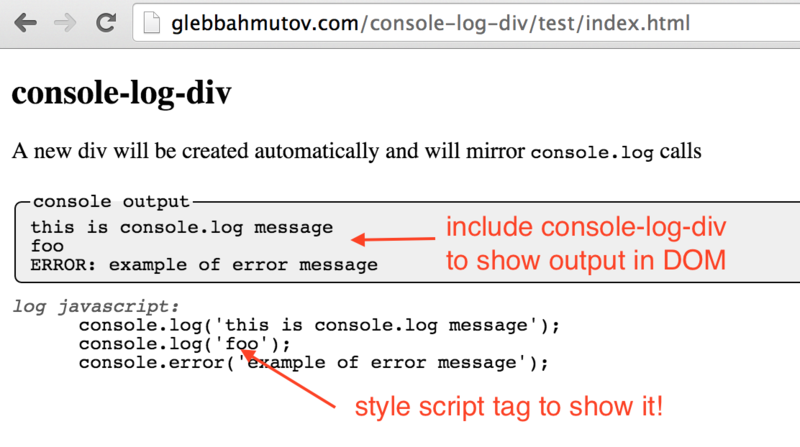 You can even style the output element using .console-log-div, #console-log-div and #console-log-text selectors. When showing the script's output, why not include the script itself that produces this output? By default, script elements have display: none style in modern browsers. You can simply style a particular script to show it in the page! Only the script #log will be visible in the page. Of course it will only be visible if inside the body element, the script elements linked from head will not be displayed. Once the demo is working locally, we need to place it somewhere. For static pages I recommend using the GitHub pages. Making a static page for a project already hosted on GitHub is as simple as making a new branch called gh-pages and pushing it to the remote. Luckily, the commands: running the git commands, picking files, pushing - are all implemented using an excellent Grunt plugin grunt-gh-pages. I like this particular plugin because it allows to pick files to be deployed - not just deploying a specific directory. "deploy": "grunty grunt-gh-pages gh-pages deploy.json"
You can check out the deployed page at the web address <username>.github.io/<repo name>/ and see which files were deployed by lookin at the gh-pages branch in the repo. The grunt-gh-pages plugin creates a temp folder .grunt that you can safely ignore as far as git is concerned. Github pages are great, but there they miss a key feature: "https" hosting. For example, to show any project using ServiceWorker, one needs to be served from a secure domain. If you need a simple "static" or even a dynamic page served from a https domain, here are the simple steps. If you just need to serve GitHub pages from a HTTPS and it is a static page, you can configure a free CloudFlare SSL service. This is not a completely secure solution, because the link between the CloudFlare to GitHub is NOT secured. If you want fully secure solution and the possibility to run a custom web server in the future, consider running a simple web server from a provider, like Heroku or Digital Ocean. Here are the steps for Heroku setup. If this is a simple application, I would enable "Automatic deploys". Every push to Github master would redeploy the application. it is flexible and powerful. Make sure to save it to the list of production dependencies for Heroku to install. npm install --save http-server You can pass the name of the base folder to server, and no caching "start": "http-server dist -c-1". Push the code to Github - it should deploy it automatically to Heroku.